Gus Johnson was an intriguing prospect out of Stephen F. Austin. In 2014, he added the Southland Conference Player of the Year honors to his impressive resume, which also included being a 3 time All-Southland Conference selection. A bowlegged and stout runningback (5’10”, 215), Gus was a gritty player who has a nice, deceptive burst at the second level. He finished his career with the Lumberjacks with 631 carries for 3892 yards and 51 TDs. Gus also had 57 receptions for 417 yards and a TD. He went unselected in the 2015 draft. After a brief stay on the Falcons, Gus signed with the Dallas Cowboys. The Cowboys were reloading at runningback after the sudden departure of DeMarco Murray. Gus led the Cowboys in the preseason in rushing, but confident in the stable of Darren McFadden, Joseph Randle, and Lance Dunbar, they opted to cut Johnson. He was signed to the practice squad, and then cut later in the month. 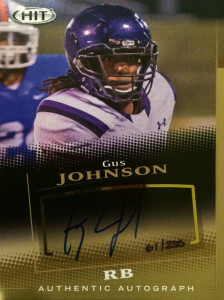 Gus quickly signed with the Atlanta Falcons and was placed on their practice squad. He remained with the Falcons through mid-2016. Afterwards Gus has spent time on a variety of rosters around the league including the Chargers, Falcons (2nd time), Chargers (2nd time), and finally the Steelers. He is currently a free agent.